Some Chionodoxa that were planted last year for a customer. They give a nice bit of Spring colour. Starting some maintenance on a new customers garden. Cut a couple of hedges today. Scarifying – Removing thatch and moss from the lawn and allowing air in to the soil. This lawn is weed and pest free. It has been well maintained and the grass has been cut on a regular basis. Applying the correct treatment at the appropriate time is essential. You too can have a lawn like this with regular lawn treatments and maintenance. 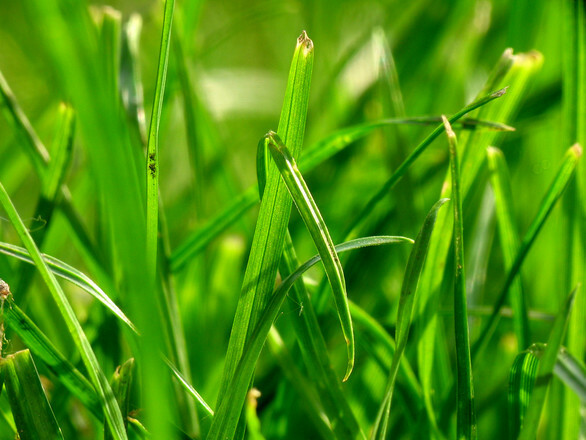 The following image shows grass that has been damaged by using a blunt blade when cutting the lawn. It has smashed the grass and damaged it rather than cutting it cleanly. An unsightly Dandelion spoiling the look of a Lawn can be easily treated with a selective herbicide that will leave the Grass plants unharmed. Just one of the services we can provide. This Lawn requires some care and attention. Some people would re-turf the area, but with careful and knowledgeable treatment, it can be brought back to a reasonable Lawn. Hedge trimming and pruning is another service we provide.